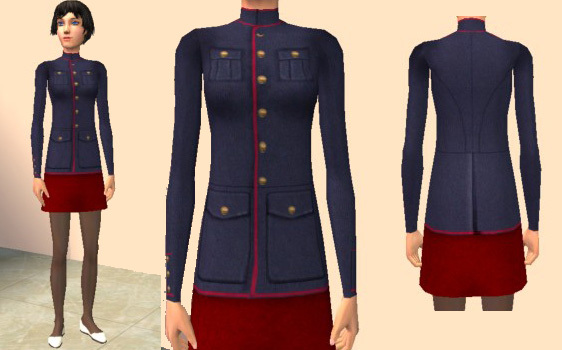 This is an outfit for teenage girls in the style of a military tunic and a skirt. It's based on the kind of tunics U.S. marines wear on more formal occasions (I think) and darn it, I want one of those myself! Well, at least I can enjoy it in my game for now, and I hope you will too. Found in everyday; Maxis mesh, no EP's required. Always - You may use and abuse my creations in any way you want! Share, or use the textures and/or alphas as bases for your own projects. If you give me gredit, you make me happy, but you don't have to.